I'm usually kind of close to the cutting edge... not right on it, but not too far behind either. I was actually one of the first kids in my class to have a calculator, but being slightly smaller than an adding machine and still having to be plugged into the wall, the new gadget didn't make its way into my backpack - but we did have one! I was also right there with the "car phone". 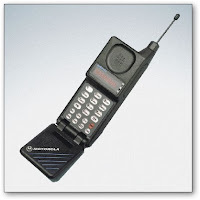 Yep... that was me, blonde, permed hair blowing under the open sunroof in my Honda Prelude, curly cord plugged into the charger, chatting on my shoe-sized flip phone just like Farrah Fawcet in Charlie's Angels. Ahhh... those were the days!! 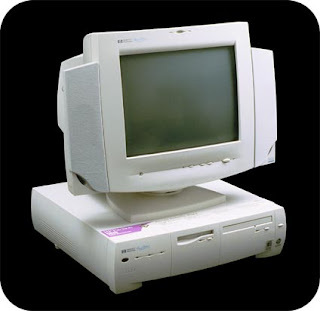 And we were also right there with the mid-90's HP Pavillion Desktop super computer with all 800 MB of hard drive (now I take that much in pictures in a week!) closely followed by one of those early digital cameras. While we may have been technologically there (with the exception of Twitter! ), we missed the Nutella wave. Letizia Golosa is really the person responsible for bringing us into the Nutella world with her Homemade Nutella Post. Her stunning shots of the creamy, chocolaty spread literally had me craving some for myself. While I haven't ventured into the homemade world yet, we did take advantage of one of those Costco super coupons for a two pack. Cutting the plastic off of the containers and opening the jar for the first time we really weren't sure how we would like it, but... Wow!! Creamy, nutty, and full of chocolate, really, what's not to like? Since our first time we have returned to purchase jar after jar. The plethora of Nutella recipes of late has me eager to try Letizia's homemade version, and I have found that the spread on our Chocolate Banana Crepes is no less than extraordinary. 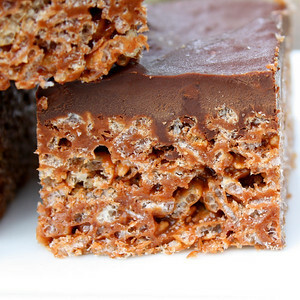 A few days ago, my son's request to make his favorite Peanut Butter Rice Krispie Treats had me reaching for the jar of peanut butter only to be met with a shriek of, "NO! You can not use crunchy peanut butter!" (though I really do think that would have been good!). After I explained that we were out of the creamy kind he replaced the crunchy jar into the pantry and returned with a fresh jar of Nutella. Why not? We got to mixing, melting a cup of the Nutella into the marshmallow mixture and then creating a decadent topping of the chocolaty hazelnut spread combined with melted chocolate. Eagerly anticipating our first tastes, I watched the smiles all around and a plate emptying fairly quickly. I'd say we have a hit! Measure the cereal into a large mixing bowl and set aside. Melt the marshmallows and butter together in a medium saucepan over medium heat. Add the Nutella and stir until combined. Pour the melted marshmallow mixture over the cereal stirring well to evenly coat the cereal. Pour into the prepared pan and use a small buttered piece of waxed paper or the back of a spoon sprayed with cooking spray to press evenly into pan. In a small sauce pan melt the remaining 1 cup of Nutella, shortening and chopped chocolate over medium/medium low heat. When the chocolate has melted and the mixture is smooth, pour over the cereal mixture. Gently spread the chocolate topping evenly across the top of the krispies. Allow the chocolate to set, then cut into squares and serve. What a great treat! Happy Nutella Day! Brilliant! 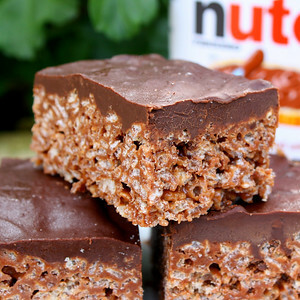 Let the Nutella craze continue - this looks delicious and I know my kids would go crazy for it! your just a genius my favorite original treat just got beaten this is awesome! yum! I miss nutella. good to hear you're an early adapter of tech-- i'm the opposite, sadly! Delicious! Amazing photos are lovely recipe..nicely done!!! That's a great computer! =) The rice krispies look amazing!! So that's where my phone went??...LOL... Looks like the one I had back when it was hi tech.. 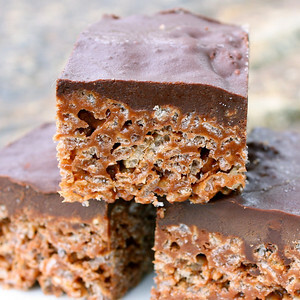 The rice crispies look great too...YUM! treat it is! Loved the krispies- good recipe! Oh Good! Another yummy Nutella recipe to try. I made a double recipe of your Nutella Fudge Brownies for Super bowl, and they are so good. 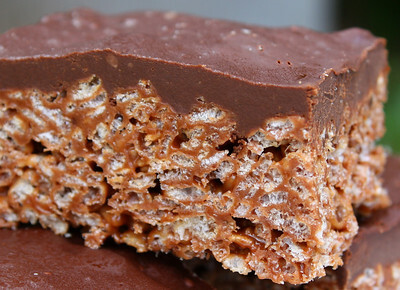 Can't wait to try your Nutella Rice Krispie Treats. I was very late coming to the "Nutella party." Wow, what a great idea! Those look so delicious and I love the chocolate hazelnut topping. I'm really behind the curve - I just tried my first Nutella on this trip to Switzerland. Don't think I'd want it straight, like they eat it on bread for breakfast, but can't wait to make something with it. Oh boy - I was cracking up reading it. The car phone - hahahaha. So funny! These really do look great. What a wonderful way to use Nutella!! Oh, I wish I'd never read and copied (and printed) this. It looks like my next binge in the making! I love this idea! Looks so delicious! Oh my Kim, what a treat! Love this. Technology improves with a blink of an eye these days. Its definitely hard to keep up. Hope you're having a fab weekend. I love that Nutella has become a mainstay of American food life. My husband used to feast on it when he lived in Italy, and he's a happier man now that it's here, too! Great recipe! Mixing Nutella and melted choc - great idea. These squares look delicious. Thanks for the timetravel back to the 90s. These little beauties look fantastic, yum!!! Nutella & Rice Krispies? BRILLIANT! I was behind the trend on Nutella too, but am so glad I have discovered it now! Adding it into rice krispies is genius and delicious all in one :) Awesome, cutting edge call :) Hope you're enjoying your weekend! I think the crunchy peanut butter would have been just fine, actually. But, your sonny boy made a good alternative choice. These look ridonkulous, Kim! Although I'm not a huge fan (don't hate me, Lindsey! ), I can absolutely appreciate great recipes. Ooh, you know what would be interesting? Adding some chopped hazelnuts into the rice mixture or into the chocolate topping. Ooh. Drool. Yay for Nutella! Your rice krispie treats are the prettiest I've ever seen! I can never wait for it to set up and they're always bloppy messes! Great recipe! You crack me up....I had that phone too...and the visual with Farrah...made me laugh! hahaha great post! Thank you for the laugh! The Rice Krispies look amazing! I'm glad you now know about Nutella ;-). 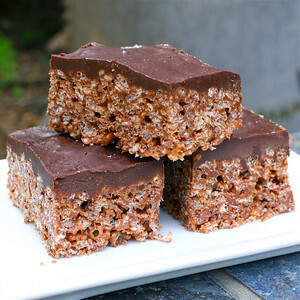 your nutella rice krispie treats look so very very good, I have never thought of adding nutella to them, what a great idea! I wish I could try a few right now! How sweet it is! Nothing like being cutting edge with Nutella! That looks wonderful. I love that used a layer of nutella. You are nothing short of genius. Oh these look good.....a fabulous classic with a Nutella twist....I adore it! Wow, these *literally* just made my stomach rumble. They look super delicious. A note on Nutella, though: you may want to consider making up some batches of your own. Apparently Nutella has huge amounts of palm oil, which is supposed to be incredibly bad for you. If you want a great simple homemade Nutella recipe (3 ingredients, 3 easy steps), try this one from Victoria, the District Chocoholic! I just made some peanut butter ones myself, but did not think to use Nutella! These look amazing! There is nothing not to like about Nutella... so glad you joined the club! I printed this one!!!!! It looks ridiculously good! These were amazing!! Thank you for posting this recipe! and we didn't even eat it with the frosting! These look delicious. I do believe I have found my next recipe to try out. Thank you! Wow. These are incredible! ...and a serious chocolate fix!